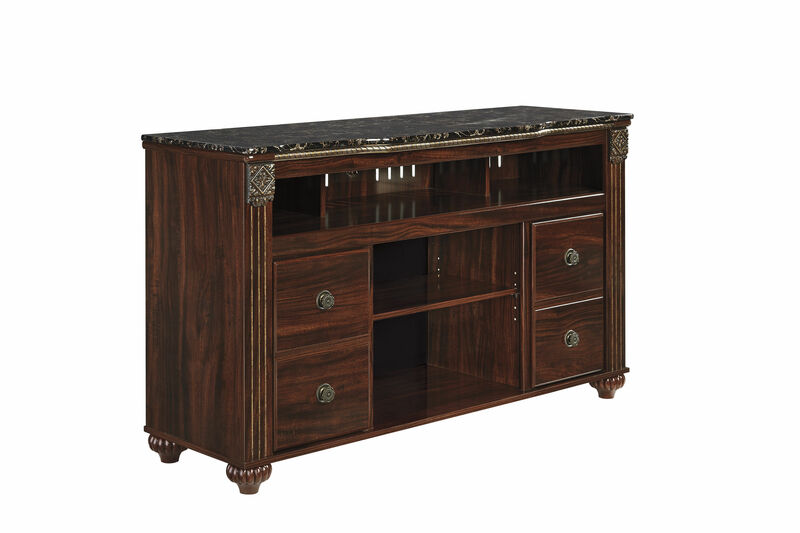 The "Gabriela" TV stand features a replicated mahogany grain bathed in a deep red finish along with richly finished moulding and rope details along with beautifully styled fluted bun feet to create a rich Old World look that is sure to transform the look and feel of any living room decor. Deep dark red finish with replicated Mahogany grain. Richly finished mouldings and rope detail. Fluted bun style feet support the cases. Detailed antique gold hardware. Credenza has adjustable shelves behind doors. Glossy faux marble top. The -68 is compatible with the W100-01,02 LED fireplace insert.